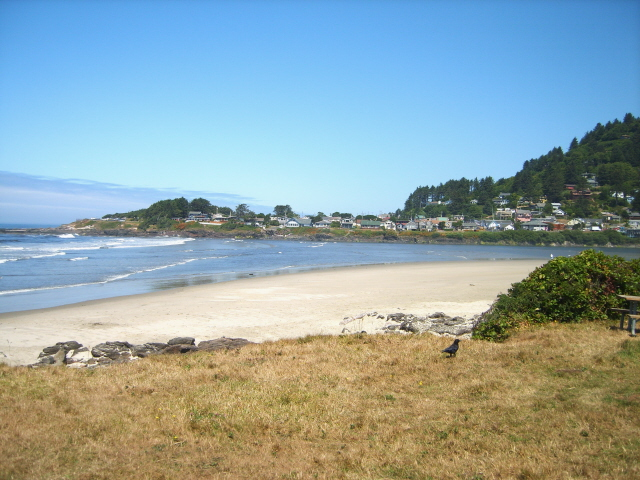 Note as of August 29 – Lodging is getting scarce in beautiful Yachats! If you are interested in joining us, please get in touch with me, and I’ll do what I can to help, including, if possible and desirable, connecting you with fellow retreaters for a potential room share. This works well for carpooling, too! Use the contact link! 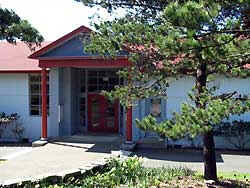 The practice will take place in the Yachats Commons building. This is the sweet historic building in the villiage of Yachats that used to be the schoolhouse, right across the street from the Green Salmon Cafe. If possible, arrive Friday and enjoy an evening in the sweet village of Yachats Oregon. A place unlike any other, Yahcats is a beach community from another era, with lovely restauraunts such as Luna Sea serving fresh fish caught and prepared by locally owned vessel by the same name, or Heidi’s Homemade, serving fresh pasta and salads. You can get read up on the shops and restaurants of Yachats here. I hope to be there Friday evening as well and if so, would be happy to help get you settled. The yoga weekend begins Saturday morning. Lodging and food are sold spearately – you are free to make any lodging arrangements you like. 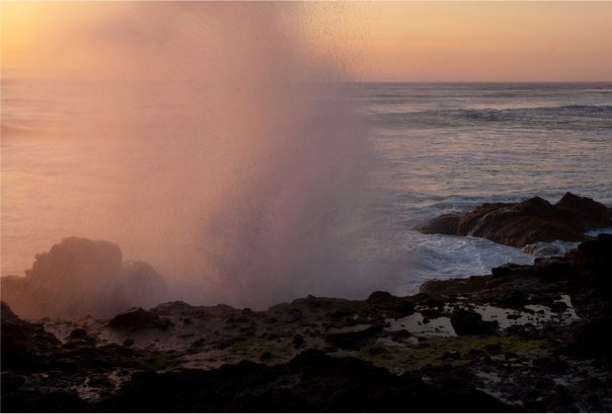 In the past, the vast majority of the retreaters have stayed at the Yachats Inn, a super sweet spot right along the ocean, about a 10 minute walk down the beach from town and the retreat space, a walk which itself is part of the magic of the event. Some participants bring their families as well, to enjoy the outdoors while we are having yoga time. The vintage original suites accept pets.Some past retreaters have also enjoyed camping on the beach, although those spots do sell out early. You can register using the paypal link here, or bring a check with you to class, or contact me for a mailing address. As always, feel free to write with quesitons, and book your room at the Inn today! You read it right – Yachats Winter retreat! Our labor day weekends in Yachats have become something l look forward to each year, as do a several repeat retreaters. We were sad to forgo our pilgrimage last September! And so this year, we are heading to the coast in January. I cannot tell you how excited I am. The Oregon coast is teaming with beauty in the winter. I’ve heard stories of magical storm watching over the ocean, agate hunting on the beach, and tide pools rich with sea life. We sometimes spot grey whales from the yoga room during our Labor Day visits, and the migration patterns suggest we may see them in January as well. A magical place to do yoga with magical people. It’s why the study of Myth can be such a powerful tool for empowerment through self understanding and yes, self love. 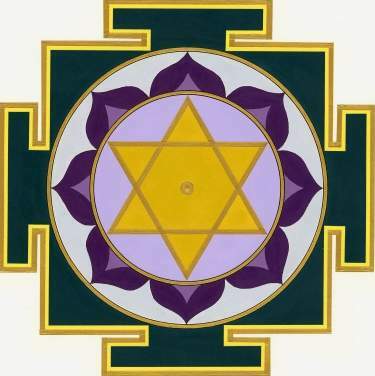 In Yachats this winter, we’ll be looking at the colorful Dasamahavidyas, or Ten Wisdoms. In order to conjure the spirit of this rich and empowering topic, I was considering using a subtitle that read something like – “Celebrating the Myriad Meaningful Manifestations of Existence as All the Ways You Are.” Wordy, right? But meaningful, because the Wisdoms, among the most widely loved dieties in India, represent the limitless but specific possibilities that our lives on this earth offer each one of us. We’ll take a look at them according to the Rajanaka teachings, where all the characters in the story are you, and try their contours on for size through Asana, image and story, basic mantra and meditation, and perhaps some journaling and contemplation. In short, through immersing ourselves in the conscious “being” practice we call Yoga. You will leave with a deeper understanding of your body and your practice, and how that fits in to the rest of your life, even the rest of the world. All levels of practitioner are welcome at this retreat. The Retreat will run from Saturday afternoon to Monday afternoon, , January 17 to 19, 2015. 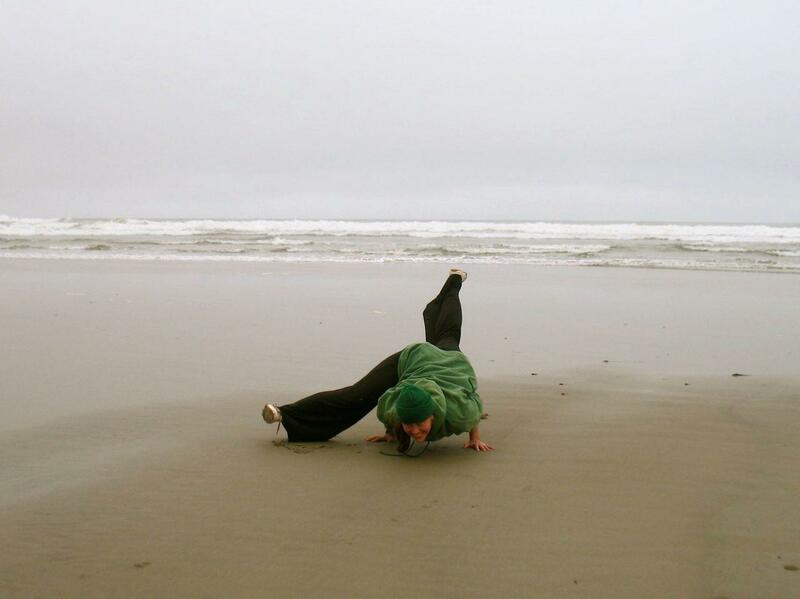 Yoga and Meditation instruction – $175 – Visit The Yachats Inn to book your room. 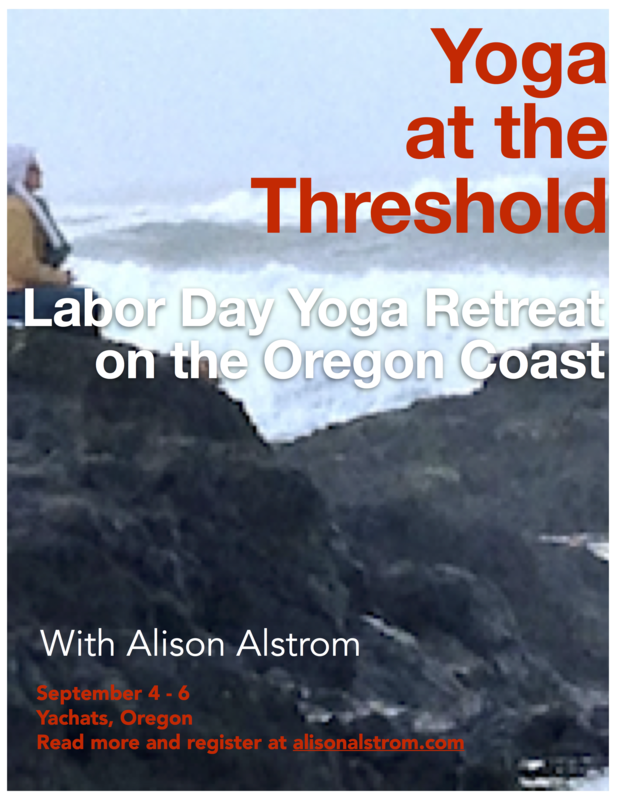 Alison Alstrom teaches a style of alignment based hatha flow that never forgets that our primary work on the mat is alignment of the heart. She is passionate about guiding students of all levels to line up with their core values, desires, preferences and potential, and to move with integrity into a life that supports the blossoming of their truest selves. You can read more about Alison and her teaching here. I love the feel of the historic Yachats Inn, and walking just a few yards to morning practice is an intrinsic part of the retreat experience for many students. Holding the retreat at the Yachats Inn rather than a retreat center as such, invites a little more autonomy and reflection time without completely disengaging from the world at large. What’s more, the Inn is located right on the coast – this picture is the view from one of the rooms in the original south wing! Lodging at the inn can run anywhere from $45 a night for sharing a room to $125 for a suite of your own. I would encourage you to visit the website and explore the many options – There is a modern wing, sleek in design, and an “original” wing, which has a decidedly vintage quality, complete with original furnishings. Some have fireplaces. The original rooms accept pets. Visit the Yachats Inn website to book your room, or for more information. And as always, please feel free to contact me with any questions. Hope to see you there! Or contact me for a mailing address if you’d prefer to pay by check. And write to me with any questions, anytime! Registration for the Barra de Potosi retreat is closed! We’ll miss you , and we do hope you can join us next year. Ahead over and sign up for my newsletter to be sure not to miss it! Biodiversity awaits you – the Multiverse is all around us! Come on a whale research excursion with scientists, relax on the beach with the herons and pelicans, take a day trip for a surf or explore the simple fishing village. I’ll be leading daily yoga sessions over the duration of our trip (with the exception of excursion day), and daily outdoor meditations. Our yoga will be infused with gentle contemplations on multiplicity in myth, diversity in matter, and the ways we weave our personal ecologies into the distinct forms and expressions of our lives. All you need to do is arrive. Barra de Potosí is is nestled at the southern end of Playa Larga beach in the greater Playa Blanca region. 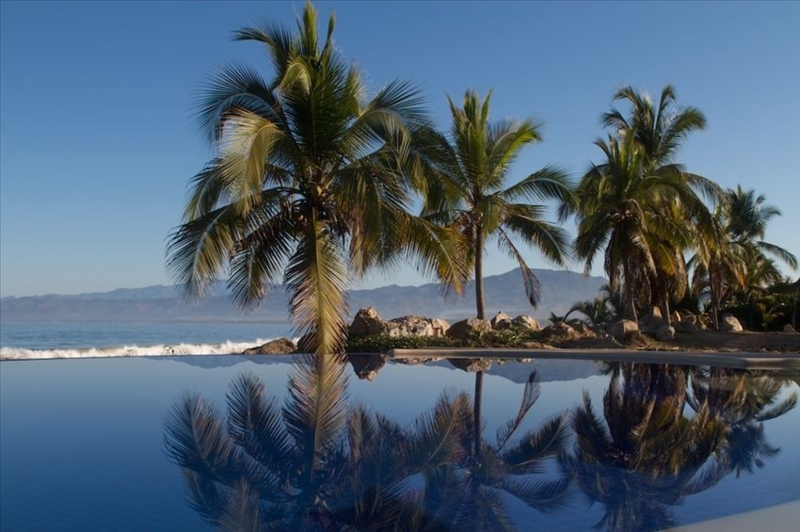 It’s a 20 minute drive from the Zihuatanejo-Ixtapa airport. This traditional, simple fishing village, located on the section of the Pacific coast known as the Mexican Riviera for its beautiful beaches, is famous for its multitudes! This little beachside hamlet boasts egrets and pelicans, tortoises and dolphins, mangroves and coconut palms and papaya trees. The beautiful photo below is a link to an article published in Oregon Live last year detailing the vast offerings of this very special and widely unknown destination. In addition to the multiplicity on shore – there is the multiplicity teaming just beneath the surface of the sea, and we have been invited to interact with that world firsthand. In the community of Barra de Potosi Mexico, something very new is evolving in support of all that’s ancient and enduring. Whale research and documentation projects are helping this community transition from a fishing economy to an ecotourism economy – one which will protect and preserve the local sea life, enrich and empower the local citizenry, and safeguard the cultural flavor of the region. What an astonishing yoga this is! An engagement of diverse currents in service of expansion of the life force on multiple levels! And we are very lucky to have the opportunity to learn about and experience this work from a front row seat. An excursion on a research vessel is built into our time together (although your participation is optional). On this unique oceanic biodiversity adventure, we’ll accompany an international team of researchers and local fisherman on a day in the life of saving their coastal home. We may see sea turtles, dolphins, manta rays – even the whales themselves! This 6 day retreat will take place from Feb 28th through March 5th, not including arrival and departure dates. Participants should plan to fly in and out of Ixtapa on the 27th and 6th, unless of course you’d like to extend your stay in Mexico. Each day will include meditation practice and ample free time. There will be yoga classes offered five out of the six days. The remaining day (probably day three) will be reserved for the Sea Life excursion in the morning, and whatever else you can dream up in the afternoon. Our Yoga practice will take place in the elegant studio space at Villa Don Manuel. This immaculate B&B also boasts the best breakfast on the beach, which is included in the lodging fee. For the most convenient retreat experience, I highly recommend you secure your lodging with Claudia, the owner and Duena of Villa Don Manuel by emailing her directly at villadonmanuel@gmail.com. Rooms are double occupancy. You may elect to stay by yourself or share your room with another retreat participant. 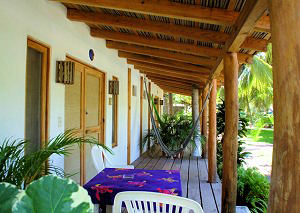 Rooms at Villa Don Manuel are approximately $95. That’s less than $50 a night, or $300 in full, if you share. Of course, you are also welcome to stay at any of the other charming little hotels in the area. There are several other beach front options. There are inexpensive options in town, a few minutes walk from the beach. Please refer to this link, and also this one, for additional information on lodging. And because we won’t be using a formalized retreat center, you are welcome to bring your families and or partners to Mexico with you, whether or not they will be practicing yoga with us. Please note - arrangements for flight and lodging and meals are the responsibility of the retreat participants! This web page and the payment instructions below are to register you for your Yoga experience and Whale & Sea Life excursion only! To register for the Myths, Multitudes and Matter Yoga and Biodiversity Retreat with Whale Excursion in Barra de Potosi, Mexico, you may contact me directly for information on where to send a check, or you may simply submit payment by using the paypal button provided below. Either way – please make sure I have a valid email address, so that we may be in contact before we arrive in beautiful Mexico! Read more about the biodiversity of the Play Blanca region here, and also here, and about the village of Barra de Potosi here, and here. And as always, feel free to contact me with any questions anytime! I hope you can come! This is going to be a trip of a lifetime.